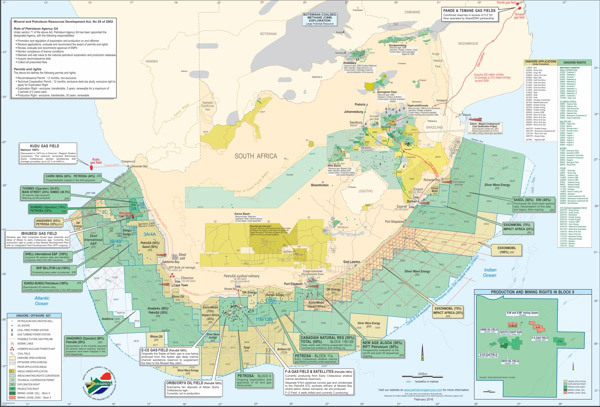 Approximately 98% of South Africa’s exclusive economic zone is subject to a right or lease for offshore oil and gas exploration or production. The Petroleum Agency of South Africa, responsible for the ‘promotion and regulation of offshore exploration and production’ maintains the national database of petroleum exploration and production. This database indicates that the past decade (since 2006) has seen a rapid increase in the application and grant of offshore rights and leases. The offshore oil and gas focus area of Operation Phakisa seeks to support the rapid development of the offshore oil and gas sector by ‘creating an environment that promotes exploration’. A target of the lab is to fast track the drilling of thirty wells in the next ten years and develop infrastructure such as a phased gas pipeline network. The extent of planned offshore oil and gas activities can potentially result in considerable negative environmental impacts. There have also been an increasing number of applications for unconventional offshore oil and gas activities. PetroSA, for instance, has recently applied for environmental authorisation to undertake hydraulic fracturing in the F-O Gas Field off Mossel Bay. In response, the Department of Environmental Affairs granted an amendment of its environment authorisation to include hydraulic fracturing in three F-O Gas Field development wells. However, the most recent iteration of the Petroleum Exploration and Production Regulations (technical regulations for fracking) excludes offshore exploration and production from its scope. Accordingly, offshore exploration and production is currently unregulated, an untenable situation, aggravated by little available knowledge of potential impacts on the marine ecosystem and existing marine uses, including fishing. Rhino Oil and Gas Exploration South Africa (Pty) Ltd recently applied for an exploration right for inshore oil and gas exploration. The inshore licence block is off the South-West Coast and stretches from Saldanha to Cape Agulhas. The application is pending. Marine mineral concession zones were established by the then Department of Minerals and Energy in 1994 on the west coast of South Africa, stretching from the Orange River mouth to Saldanha. Several marine mining companies have been granted prospecting and mining rights in these concession areas. 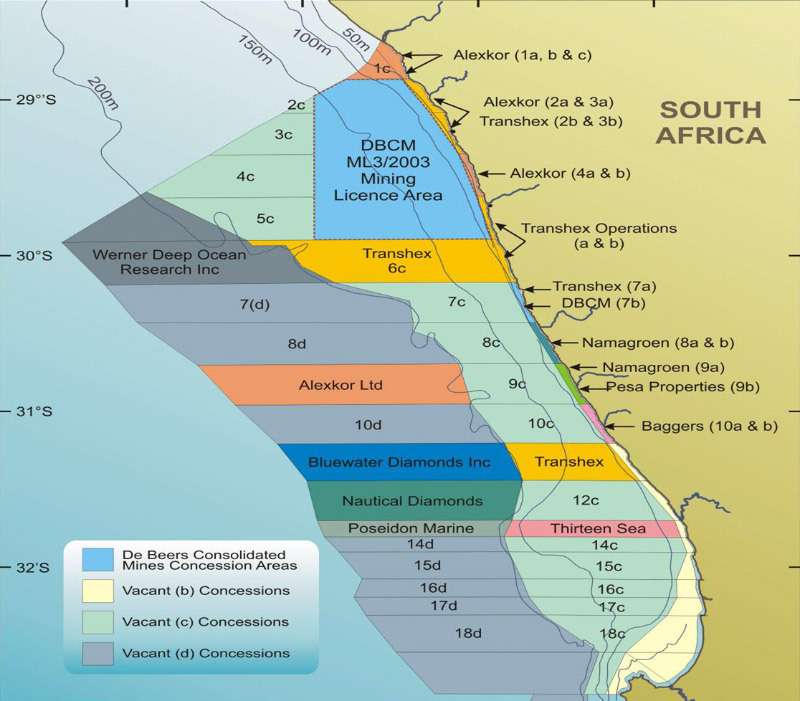 However, the marine diamond mining industry is dominated by De Beers Consolidated Mines Ltd., Alexcor Ltd. and Trans Hex Operations (Pty) Ltd. There are a number of environmental impacts associated with marine diamond mining. An increasing number of prospecting rights have been applied for and/or granted for offshore heavy mineral sands. In 2004, Richards Bay Minerals was issued a five-year heavy metals prospecting right, in an area on the northern KZN coast, stretching between Richards Bay and Cape St Lucia. The prospecting sought to determine the viability of offshore mining for ilmenite (converted to titania slag and iron), rutile and zircon. If a mining right were granted, Richards Bay Minerals would have implemented a dredge-type system for extraction. In that case, the Oceanographic Research Institute and Wildlife and Environment Society South Africa (WESSA) were concerned that the type of offshore mining that would proceed could lead to ‘undersea trenches and opencast mining operations’ which would significantly disrupt the marine ecosystem and food chain. In 2012, Coastal Phosphate (Pty) Ltd applied for a prospecting right for marine phosphate and potash. The Background Information document indicates that the proposed prospecting area is located offshore from Cape St Francis and covers an area of 1043 km2. In 2012, Fast Pace Trade and Invest (Pty) Ltd was granted a prospecting right for heavy minerals and gemstones in a block centred around the mouth of the Tugela River, offshore and extending northeast of Darnal in KwaZulu-Natal, between 30-70 metres depth contour. Recently, Mineral Sands Resources (Pty) Ltd (MSR) applied to expand its coastal mineral sand mining operations (the Tormin Mine) further offshore. On 13 November 2015 DMR granted a prospecting right to ‘MSR’ for garnet, heavy minerals, leucoxene, monazite, rutile and zircon. This right expands the Tormin mine coastal operations further offshore by extending the current operations 10 500ha seawards. This offshore expansion was granted despite significant environmental damage to the coastal environment perpetrated by MSR and intense media criticism and opposition from local communities and civil society. The Environmental Management Programme prepared on behalf of MSR states the prospecting area falls within one of the most threatened habitat types in the southern Benguela. Furthermore the prospecting area is located in close proximity to a Cape fur seal breeding area.